On October 10th, Sulli attended an event in Seoul. At that time, Kpop fans were extremely surprised at the currently deteriorating appearance of the female idol. So far, Sulli has always been known by K-pop fans as SM‘s princess with her goddess-like beauty. However, the fans were extremely shocked by the current appearance of the idol. 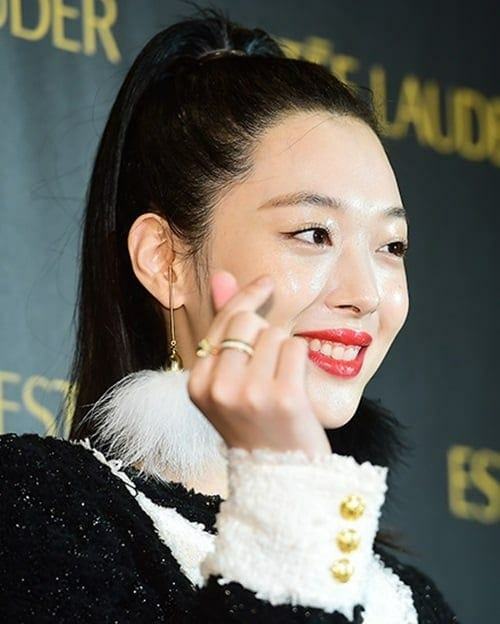 On the evening of October 10th, Sulli attended an event of the famous cosmetic company Estee Lauder in Seoul. The media also showed their surprise at her fading beauty when seeing Sulli’s skinny body with a face full of oil as well. However, at an event on October 10th, the fans were shocked by the current image of Sulli. At the event, Sulli dressed up in a short black dress which accidentally made her look much skinnier. Besides, the ponytail hair style also made SM’s artist become older and less beautiful than before. Sulli‘s face full of oil and her gummy smile disappointed a lot of fans. Many netizens even commented that without photoshop Sulli under the flash is no longer as beautiful as in the magazine. According to the fans, it seems that Sulli has recently encountered some shocks in life, causing the female idol to look unenergetic. Many people were also worried when Sulli becomes skinnier and skinnier but does not look as attractive and young as before.